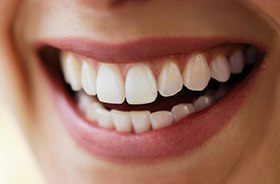 Your smile is a clear reflection of your personality and your emotions – in fact, it’s likely the first thing someone else will notice about you when meeting for the first time. At Santavicca Dental Professionals, our caring team wants to help you achieve your ideal look and the high level of self-confidence you deserve through personalized cosmetic dentistry. Our recommended services will be an ideal match for your personal goals and preferences, and oral health and durability will be prioritized in addition to aesthetic value. We look forward to welcoming you into our Lebanon, NH dental office for an initial consultation! Do you have several dental flaws that you’d like to address? Porcelain veneers may be the right solution for patients who are interested in a comprehensive way to refresh their appearance instead of undergoing several different procedures. These restorations are crafted from high-quality materials to be an ideal match for natural tooth enamel in the form of very thin shells – thin enough that they can cover the visible surfaces of your smile seamlessly, hiding stains, chips, cracks, misaligned teeth, gaps, and more. 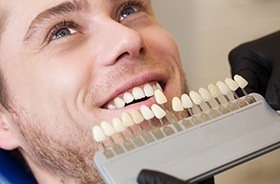 When a patient is in need of a new dental crown, inlay, onlay, or other restoration, we are happy to offer image-friendly materials that can help them maintain their smile’s natural appearance. These ceramics are 100% biocompatible and so precisely matched to tooth enamel that they even reflect light in the same way. We can create them in the traditional manner (through lab fabrication) or with the help of our same-day CEREC technology for faster results. 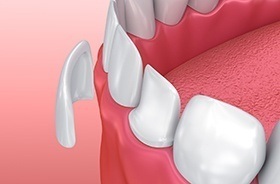 Dr. Santavicca may recommend direct bonding for relatively minor cosmetic issues, such as small gaps between teeth, tiny chips in the enamel, or the presence of discolored spots. This procedure only takes one appointment of a patient’s time in most cases. 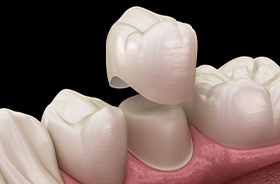 Composite resin (carefully shaded to match with the patient’s natural smile) is applied to the tooth surface and then artistically sculpted into place over the flaw in question before being hardened. These improvements can last for several years at a time with the help of regular professional dental checkups and a good oral hygiene routine at home. Over the years, it’s likely that most patients will notice that their smile loses some of its natural glow. Stains and yellow discoloration may arise as well. This can happen for a number of reasons, from diet to oral hygiene to completely unavoidable factors like age and genetics. Here in Lebanon, our team can help you reclaim a beautifully bright look with professional teeth whitening solutions! ZOOM! In-Office Whitening can improve enamel by several shades in a single appointment, while a ZOOM! take-home kit could be the right choice for a patient who would prefer a more gradual and flexible treatment experience. If you feel that your smile looks overly short or uneven, consider undergoing aesthetic gum recontouring with our state-of-the-art SIROLaser. During this procedure, our team will carefully sculpt the natural gum line in order to remove any excessive tissue, reveal beautiful dental structure hidden underneath, and correct any symmetrical imbalances. This instrument’s concentrated beam is very precise, and patients will recover quickly from the comfortable experience as well.